Fragments d'un panneau en cours. 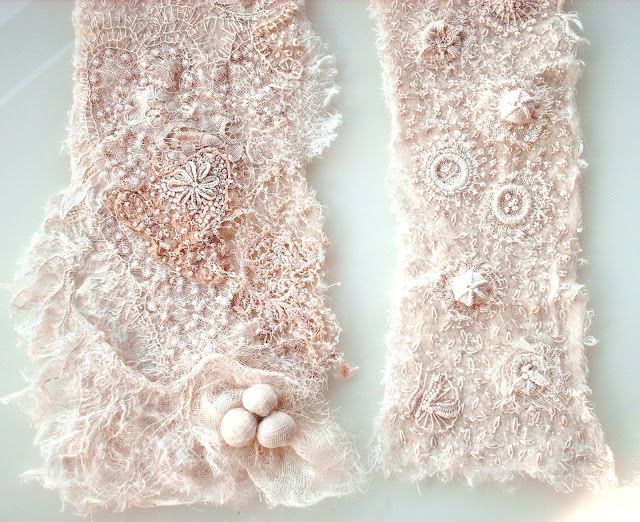 Etamine, laine cardée, dentelle, fibres végétales, broderie sur hydrosoluble, broderie main. Je sius absolument ravie ! Qu'est ce que c'est beau ................... Je suis sous le charme ! This is so stunningly gorgeous...Can't even imagine the hours that you have put into this with all of the delicate embroidery. Really and truly amazing. Merci à toutes pour vos commentaires. Thank you everybody for lovely comment. Have you ever seen Karen Ruane's work: white, white, white ...? Aaah Cécile your English is quite good! (doing is learning, that's what I've experienced !!!) It might be a bit like my French: I can read and understand much (100 idees, Marieclaire Idee ...) Hey, when there are pictures it always helps a LOT ha, ha ! C'est magnifique ! Quel travail délicat ! C'est tellement beau! Merci pour le rêve! Ooooooh, Cécile. Tu rends le travail en blanc si beau en gardant le subtilité. Your work is so beautiful, thanks for sharing.